Inspired by a campaign to end the ancient Chinese practice of foot-binding, the Liberation Pledge is turning the tables on animal cruelty. Thanksgiving can be difficult for animal lovers. Over 40 million turkeys, who love being petted as much as dogs, are brutally killed over the holiday. Their bodies are often the centerpiece of the Thanksgiving feast, as animal advocates beg our families to serve anything — say, a salad — that we can actually eat. But a strange thing is happening this year. Animal rights advocates across the country have stopped begging for an option at the table, and started demanding a table free of flesh. The trend, which has been supported by animal rights groups such as Last Chance for Animals, Free from Harm, and Direct Action Everywhere, is called the Liberation Pledge. And it has three simple components. Refuse to eat animals. Refuse to eat at a table where animals are being eaten. Ask others to do the same. What might seem a case of vegan fanaticism to omnivores, however, is actually a strategic effort to turn the tables on violence that most Americans, in fact, already oppose. Consider: the evidence is overwhelming that animals such as turkeys have the same feelings that we have. Yet violence against animals is skyrocketing. While an overwhelming majority of Americans oppose animal cruelty — indeed, one in three go even further and say that animals should have “the same rights as people” — the percent who are vegetarian has not moved. How can so many Americans support practices that, when made visible, are so horrifying that we are forced to look away? The answer, surprisingly, lies in another historical example of normalized violence: foot-binding in China. I know this because it’s my family’s history, too. My great grandmother never ran, walked, or even stood as most of us can. Instead, from a very young age, her feet’s bones were brutally broken, as a bandage was tightly wound around them. The flesh that grew through the bandage would often rot and be cut away. The end result — a deformed foot that was just 3 inches long — was considered a sign of beauty and sophistication. All the girls with bound feet would suffer immensely for this sign of prestige. 10 percent would die. My great grandmother survived, but she spent the rest of her life standing, if at all, on hobbled feet. And yet the practice ruled China for 1,000 years. Chinese scribes condemned this cruelty hundreds of years ago — to no effect. Activists lobbied the imperial government but were met with silence. Others attempted to educate parents, one by one, but the people were unmoved. It seemed foot-binding would never end. Then suddenly, after 1,000 years, foot-binding collapsed. In The Honor Code, Kwame Anthony Appiah reports that a new campaign transformed one region south of Beijing from 99 percent in support to 0 percent. 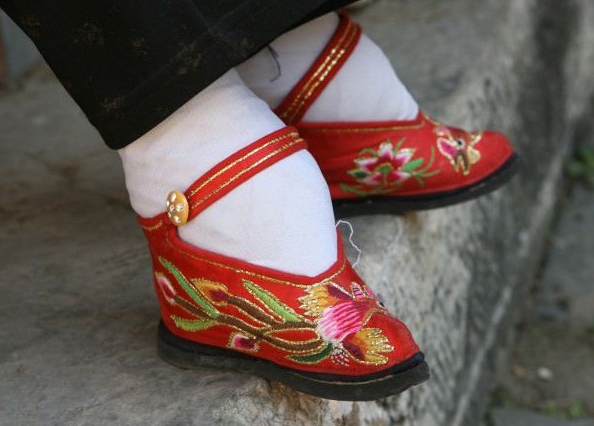 In 30 short years, the practice of foot-binding was completely eradicated. How? To end the practice, the campaigners made three insights about social change. First, campaigners saw that, while many families had concerns about foot-binding, the families were never given a real choice. Any daughter who did not have her feet bound, after all, was believed to be impossible to marry. Her family would be looked at with shame. The campaigners realized they needed to show that there were, in fact, families who had chosen to abstain from foot-binding, and publicize this choice widely. The second insight was that, because many families faced incredible social pressure to “fit in,” they needed social support to change. Thus, the campaigners came up with The Pledge. A public promise to never bind their daughters’ feet, The Pledge allowed the families of China to look around and see others joining them. They did not have to feel alone or ashamed. The third insight of the campaigners was that they needed to “play offense.” The families could not settle with changing their own practices. Many families, after all, would regress over time, if there was no growth in the movement. To survive, The Pledge-signers needed to change others. So the campaigners added a second element to the pledge: sons of Pledge families must never marry a woman with bound feet. This was an ambitious commitment. After all, in many regions virtually all women had bound feet. Barring sons from marrying such women might end the family line in a culture where continuing the family name was of utmost importance. However, the “offense” component of the pledge ended up being crucial. It put the traditionalists on the defense, and served as The Pledge’s engine for growth. The families banding together were not just making a different “personal choice” but were standing for a moral principle — protecting the nations’ daughters — that applied to every family. Others were motivated to join The Pledge movement, moreover, because if they refused, they might lose an opportunity to marry their daughters into a Pledge-signing family. In short, the “offense” component allowed Pledge families to move beyond personal choice and towards social change. The pledges grew like wildfire over two decades. In 1912, fueled by decades of Pledge signing families, foot-binding was banned. And today, modern Chinese (such as my own father) look back at the practice with utter disbelief. The parallels between foot-binding and animal agriculture are unmistakable. Like foot-binding, animal agriculture is an unspoken oppression that none of us are given a real choice on. We are born into the system. Like foot-binding, those who attempt to remove ourselves from that system often face ridicule. We need support if we are going to take a minority stand. And like foot-binding, animal advocates often feel on the defense — ashamed to say what we believe. But to create social change, we need to speak strongly and put traditionalists on the defense. Early stories of pledge takers suggest we could be on the verge of something big. Pledge takers have changed their entire schools or transformed relationships with family members, creating “zones of nonviolence” wherever they go. Instead of feeling silenced or ashamed, animal advocates are now proudly saying, “Mom, you and I both believe in showing respect for animals, so we need to have a Thanksgiving where no animals are being served.” And they are transforming, not just Thanksgiving, but perhaps the very world in which we live. Will the Liberation Pledge take off as the pledge against foot-binding did in 19th century China? Only time will tell. But ambitious efforts such as this suggest that change is on the horizon. A movement that began just 40 years ago is finally coming into its own. And perhaps a generation from now, we will, like my father, look with utter disbelief at the horrendous things our grandparents did.